I’ve always seen the Christmas tree as a sort of hub during the season, the place where all the family gather each night as Christmas lights are turned on. It’s the opportunity to slow time during the busy season. You pour a cup of hot cocoa and settle in. A little moment in the big picture, but one we look forward to. 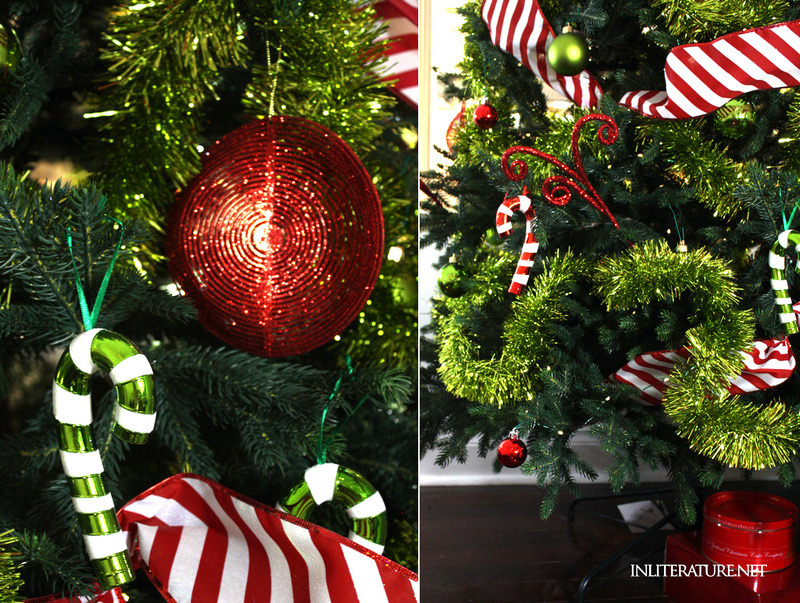 This year I decided to ‘Who-ville’ my Christmas tree to fit in with the rest of my Christmas decor. Start with the lights. Weave them through the tree, then turn them on to adjust and tweak. Weave Grinch green tinsel through. Create ‘wiggles’ instead of straight lines. Not only is it more in line with the Who-ville’s chaotic design style, but it’s also more forgiving. 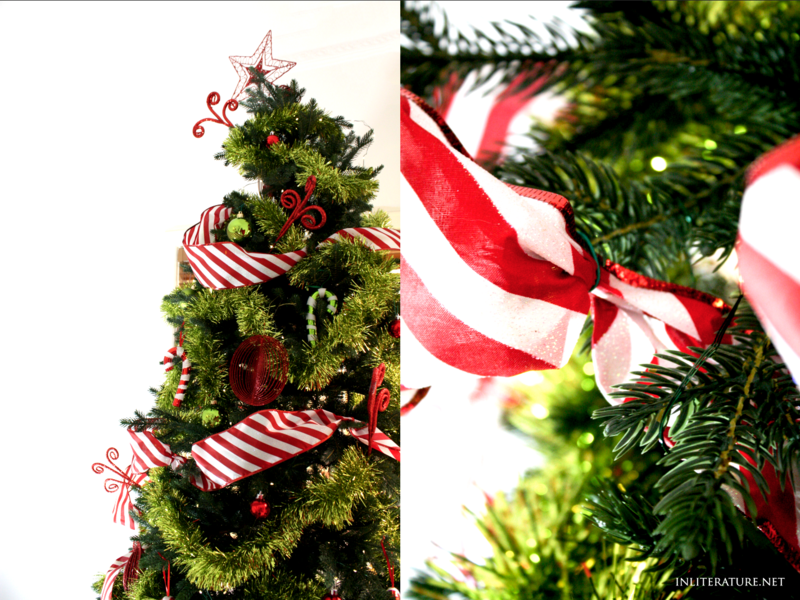 Wrap and pin candy striped thick ribbon. To make sure it’s not a solid stripe wrapping around the tree, pin sections, so it looks like it’s weaving in and out of the branches. Don’t have candy striped? Try big polka dots or zig zags. 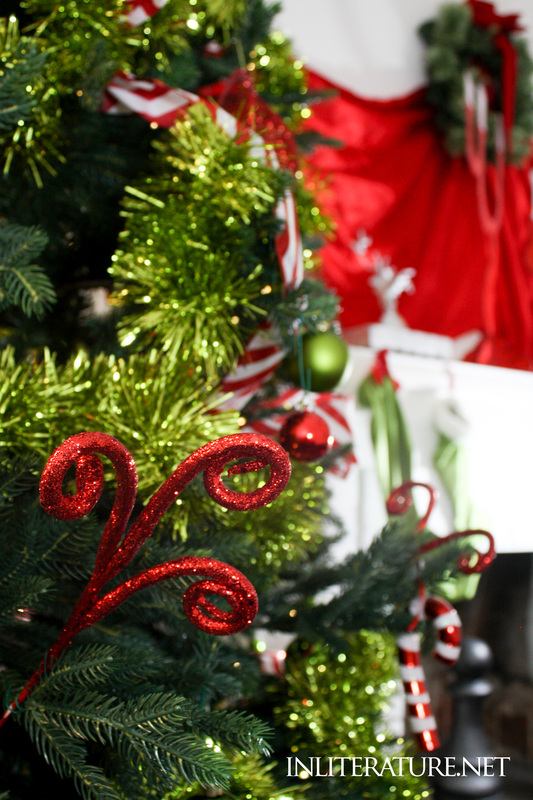 As we start to add on additional decorations, try to use odd numbers. Why? In design, they suggest the rule of three’s (odd numbers) because it’s a natural pattern found in nature, and it helps the eye and brain find that pattern to follow. While we might not consciously be aware of that pattern, our mind is telling us what we are seeing feels more appealing. Add in curly tree picks. I found these decorations at Michaels the other year, and they automatically add the Who-ville feels. Keep it simple. While we want the tree to feel topsy-turvy, we don’t need much, both when it comes to the different types of hanging decorations, but also the colour. As I mentioned in the post on throwing a Who-ville inspired Christmas party, I selected a simple colour scheme of red and white, with a Grinch green as a highlight. The next decorations you add should be your largest ones. I had seven big warpy circles that I placed around the tree. 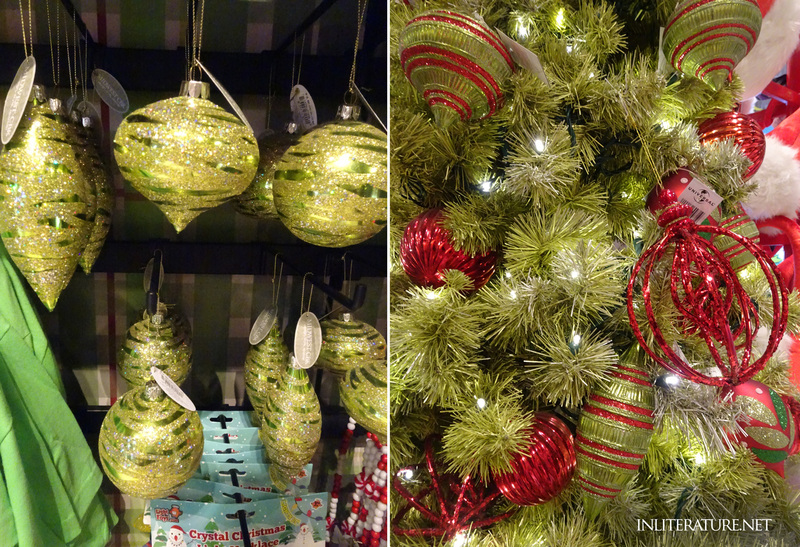 Next, I hooked on Grinch green and red candy cane decorations–use whatever you’ve found in the stores. Then fill the gaps with medium sized Grinch green balls and small red balls. Top the tree with a red star. In How The Grinch Stole Christmas!, the illustrations show all the Christmas trees adorned with irregular shaped red stars on top. Turn on the lights again, take a step back and make any tweaks and adjustments. 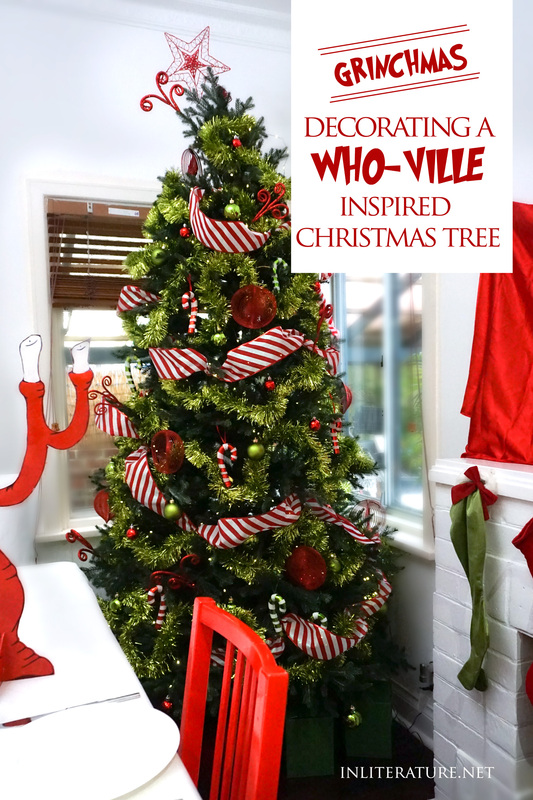 And with that, you have your Who-ville inspired Christmas tree for yourself and your family to sit around and enjoy each night. There are other ways of decorating your tree. 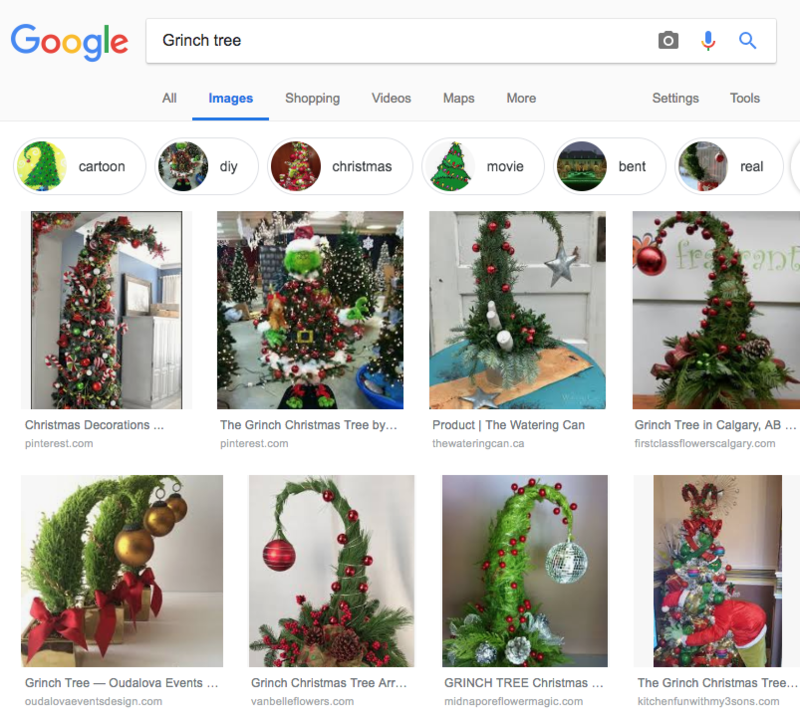 A Google search for Grinch tree comes up with wire wrapped trees with one big bauble on the top. As a larger size, they would make great pieces to put next to your front door. 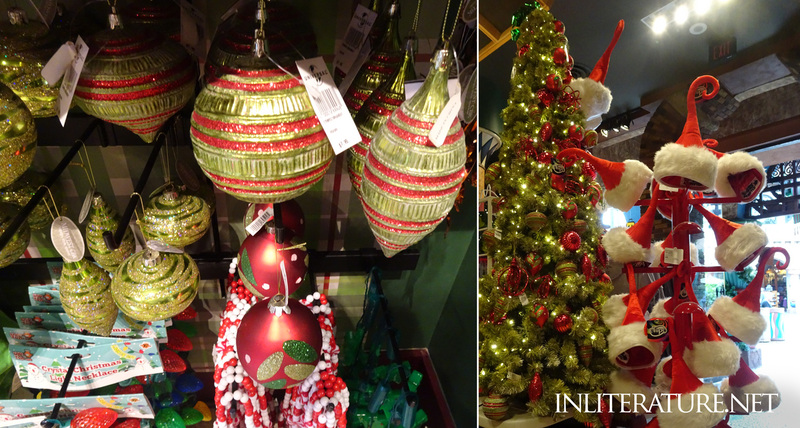 I thought I’d finish off by adding some Grinchmas tree inspiration straight from Universal Studios in the Port of Entry Christmas Shoppe. 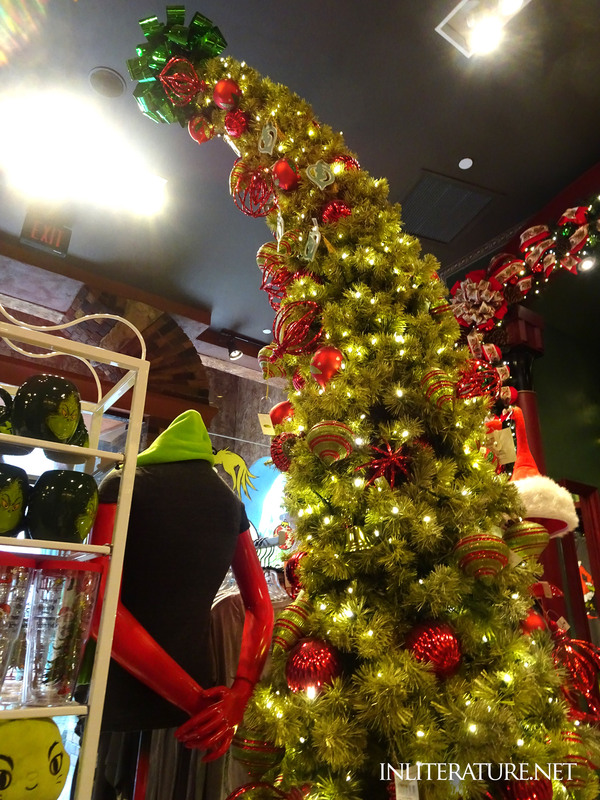 With a leaning tree in the perfect shade of Grinch green, they have some fabulous hanging decorations finishing the decorating off.